Databases in Access are made out of four objects: tables, queries, forms, and reports. Together, these articles enable you to enter, store, investigate, and incorporate your information any way you need. In this exercise, you will find out about every one of the four objects and come to see how they communicate with each other to make a completely useful social database. You may definitely realize that tables are sorted out into vertical columns and horizontal rows. In Access, lines and segments are alluded to as records and fields. A field is something beyond a section; it’s a method for sorting out data by the type of information it is. 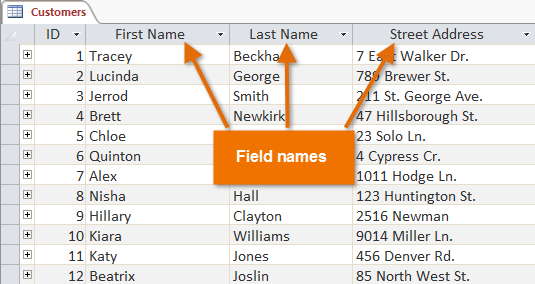 Each snippet of data inside a field is of the same type. For instance, each section in a field called First Name would be a name, and each passage in the field called Street Address would be an address. Likewise, a record is more than just a row; it’s a unit of information. Every cell in a given row is part of that row’s record. Notice how each record spans several fields. Even though the information in each record is organized into fields, it belongs with the other information in that record. See the number at the left of each row? It’s the ID number that identifies each record. 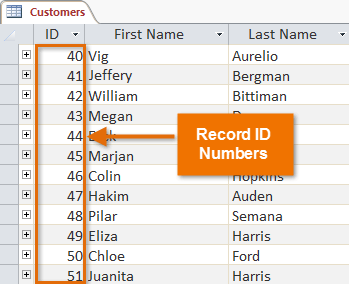 The ID number for a record refers to every piece of information contained on that row. Tables are useful for storing closely related data. Suppose you claim a pastry kitchen and have a database that incorporates a table with your clients’ names and data, similar to their telephone numbers, personal residences, and email addresses. Since these snippets of data are on the whole points of interest on your clients, you’d incorporate them all in the same table. Every client would be spoken to by a unique record, and each kind of data about these clients would be put away in its own particular field. On the off chance that you chose to include any more data—say, a client’s birthday—you would basically make another field inside a similar table.